Elizabeth Montgomery is a criminal lawyer and she has worked hard to get where she is today, after all her hard work she has finally decided to take a vacation, a hiking trip in the mountains in North Carolina. Things do not go to plan though and she doesn't even get to spend one night in the beautiful secluded cabin she has booked. After taking an evening hike in the woods, Elizabeth is the victim of a vicious animal attack, or so she thought. When Elizabeth is rescued by a handsome stranger name Abraham her whole life is turned upside down forever. 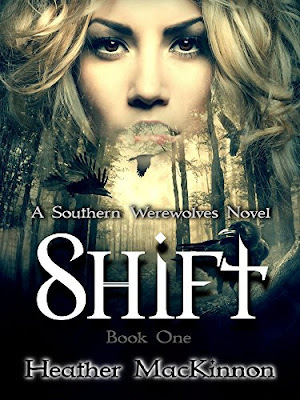 Its been awhile since I've read a werewolf book as I started to find them a bit all the same. This book, however, had me totally hooked from the very beginning. I couldn't put it down, fantastically written with wonderful characters and overall brilliantly written. Be prepared to be up all night when reading this book, because I know I was. It kept me on the edge of my seat desperate to know what was going to happen next. I was also desperate to know if Elizabeth and Abraham were going to end up together and if Elizabeth could survive the change. I cannot wait to read the rest of the series, I will most definitely be reading the next book and anything else Heather MacKinnon brings out. Another author and series that have found their way into my favourites category for 2018.